For more than 5 years, I’ve been wearing Fivefingers for seemingly-endless different types of activities. Running, climbing, kayaking, etc. And in the past, my favorite type was the Sprint. It was versatile, light, thin, and breathable. But those were discontinued. But now, years later, I’ve found the model that rivals the Sprint for top spot in my list of favorite models of the shoe. The CVT Hemp is also light, also has a pretty thin sole, and is breathable. But it’s also the most normal looking of all the pairs I’ve owned—besides maybe the brown kangaroo leather pair. 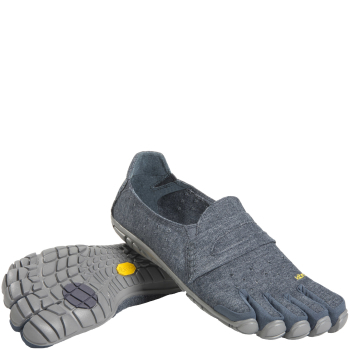 When I wear Fivefingers, I want the benefit but I don’t want most every person staring at me. I’m all for being an ambassador, but I don’t like having to think about all the eyes that are judging me. I am more than my ten toes. But these shoes in particular are excellent for any activity—riding my bike, running, gymnastics, you name it. However, because of the hemp material, even though it looks pretty durable, this model probably isn’t the best for climbing trees (which is not a problem for some people, but others, maybe). But there’s no reason you can’t slip ‘em off before scaling. All in all, if you’re looking for a versatile check out the CVT Hemp or maybe the Furoshiki Wrap On Minimalist, though the latter model is pretty conspicuous. Otherwise, they’re amazing.